Benzylation reaction is carried out 5-phenyl-1,3,4-oxadiazol-2-thione with benzyl chloride in acetone and HMPA. In the acetone was obtained exclusively S-benzyl derivative and in the case of HMPA - isomeric mixture of S- and N-benzyl derivatives were obtained, individually isolated, characterized, and their structure was proved by spectral methods. By slow evaporation of solvents at room temperature were obtained two polymorphic crystals of 5-phenyl-1,3,4-oxadiazol-2-thione from acetone 1 and ethanol 2. 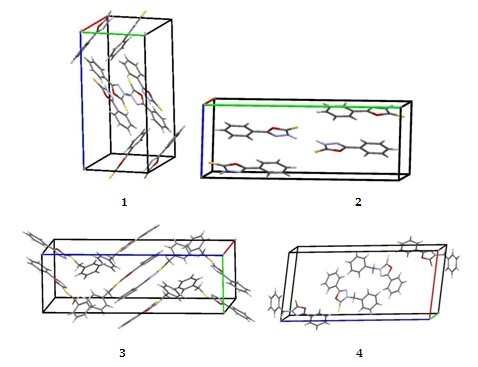 Crystals of 2-benzylthio-5-phenyl-1,3,4-oxadiazole 3 and 3-benzyl-5-phenyl-1,3,4-oxadiazol-2-thione 4 obtained in similar conditions have structures without the inclusion of solvent molecules. Oxford Diffraction. CrysAlisPro. 2007. Oxford Diffraction Ltd, Abingdon, Oxfordshire, England.